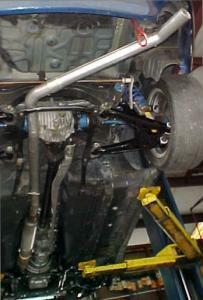 We have tested many headers and have settled on these stainless headers from Racing Beat. They have a nice cast flange that mates up with the ports in the head very nice. We add a flex joint to further reduce the chances of stress cracking and straight out the kink at the end. Then finish if off with a convenient 3/8″ flange. $645 We can modify your header with a flex and flange to fit our rear tailpipe for $100. You could convert your Header to our exhaust system. To place an order please call 863-324-4539 or email your name, address and phone number to mvsrx7@aol.com. We will call with a total and for payment information. Thank you.